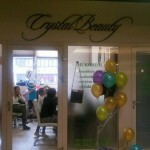 Hairdressing, cosmetics, pedicure, manicure, body treatments, teeth whitening! Quality service in quality surroundings! For free appointments and prices visit the parlor, right across our reception!